Solid Durable Cypress lumber is naturally resistant to insects and decay. It is renewable and sustainable, making it ideal for our line of beautiful functional planters for use in wet or dry environments. These handsome planters can be clear sealed or stained to match your color preference...or can be left to weather naturally a classic silver grey. 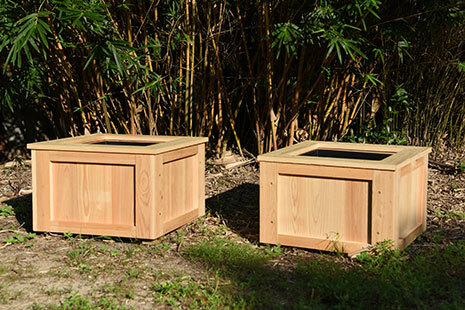 These planters will last for decades to grace and enhance your landscape design. We managed to get our 14' x 20' Gothic Arch Greenhouse up on its foundation and all closed in before the snows hit us this past Fall, and now that warmer weather has returned, we have begun to install the air exhaust fan and the two motorized air vents. We still need to dig a 325" ditch for the propane, water and electrical services, but hope to have that task accomplished before the month of May arrives. My wife has of course started to plant things, so it will be a race to see if we can get these essentials completed before the hot weather hits us. So far we are very happy with the purchase, and would like to compliment you and your associates on your willingness to be patient with our many phone calls on needed help and advice with the erection of the building, and more recently, with the installation of the ventilation equipment. We were very fortunate in having picked a good site, and the building looks quite attractive from our kitchen window. We've had many envious compliments, and now hope to be able to spend many enjoyable hours working in the warm atmosphere of our very own greenhouse ... particularly when it's below zero on the outside. We will keep you informed as things proceed. I am the proud owner of an early-model Gothic Arch Greenhouse. It was originally built out of corrugated fiberglass and redwood about thirty years ago. When I set out to refurbish it, I didn't know that the company that made it was still in business. After working with wooden greenhouses, I understand why they're around thirty years later. They helped me select new products to upgrade the greenhouse, and also provided technical assistance along the way to make sure it was done right. The greenhouse is now as good as new again. 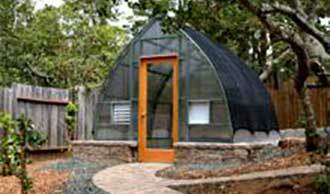 I highly recommend this company if you need a greenhouse. I expect that my greenhouse will last at least another 30 years, and maybe even fifty (which is probably longer than I'll be around).